Are you a cat and a horse lover? Who said you have to keep the two animals separate? If your horses live in a barn in your backyard, bring your cat to visit your equestrian friends. These two animals can live in harmony and can easily become the closest of friends. Let’s take two stories as inspiration: Morris the cat and Champy the horse, and Sappy the cat and Dakota the horse. These inspirational (and adorable!) stories prove that two animals of different species can become best friends. Do you want to learn more about these stories and why a cat and horse can become best friends? Continue reading and understand why felines and equestrians make amazing friends. Jennifer Boyle is a horse and cat lover. She has both horses and cats as pets. The two animal species always lived together with no problems, but she never saw a bond like Morris and Champy. Morris was a 9-month old kitten when he was adopted. He lived in shelters his whole life, so he was pretty shy when he first got home. He was especially shy to the large and beautiful horses that Boyle kept on her land. Until Champy came along. Champy is a friendly horse who wants to be friends with everyone. When Champy saw the shy cat, he went over and said hi. Morris was a little shy while Champy groomed the cat and give him horse love. Champy persisted trying to make friends with the scaredy cat. Eventually, Morris warmed up to Champy. Morris started jumping onto Champy’s back and returned the grooming. Today, Morris and Champy and inseparable. The two take naps together, eat, drink, and go on adventures. Morris loves riding on Champy’s back as they explore the outdoors. Another unlikely friendship pair is Dakota the horse and Sappy the cat. 15-year old Dakota is a large adult horse. But one-year-old Sappy is a tiny kitten. The two love cuddling and spending lots of time together. Denice Kinney is the owner of the two besties. Kinney got Sappy as a kitten. As Sappy grew, she noticed Sappy started hanging around the horses. Sappy grew attached to Dakota. Sappy would lie next to the horse and even started lying on Dakota to take naps. Eventually, Sappy started crawling up on the horse. Sappy loves horseback rides and wants to play with the huge horse. It came to the point where Sappy was always in Dakota’s stall. During feeding time, Kinney started putting Sappy’s bowl in Dakota’s stall. Both animals are now completely inseparable. Dakota also loves Sappy. Dakota is gentle and loving toward the feline. Dakota lets Sappy take naps on him and they both go on horseback rides together. Dakota also grooms the cat and picks Sappy up by the nape of his neck, the way a momma cat does with her kittens. These stories warm your heart and make your love for animals stronger. But when cats form friendships with other animal species, does it mean something even stronger than what we think? Cats always seem to be selective when making friends. They run and hide when company comes over. And they may become friends with one family member over the others. But cats tend to warm up to other animals, and horses are a great example. The independent animal has a soft spot. Cats have an instinct that’s unbiased toward breed or animal. This surprises cat owners because of a cat’s reluctance and shyness. But this is uncommon cat behavior. This is why horses let cats do things that many horses don’t allow, such as the cat sleeping on the horse’s back. This is also why cat owners tend to love horses. Even though the horse is a lot bigger, horse and cat personalities are very similar. So if cat lovers are looking for a friend, consider getting a horse. Don’t be surprised if you become a crazy horse lady and start ordering products from The Horse Gift Shop. The myth is dogs and cats are enemies. While some dog breeds see cats as prey or a toy, other dogs are kind and gentle towards cats. Cats appreciate this behavior and make dogs their true companions. No one really knows why cat and dog bonds form. But cats and dogs are complex animals; some cat breeds have playful and outgoing dog traits, while dogs breeds can have calm and shy traits that cats have. Cats especially love caring for puppies. They groom and bunt on dogs, showing nurture and love. Dogs also show this love back by grooming cats. Cats who love dogs tend to have social and curious personalities, as opposed to skittish cats. Dogs who love cats are less playful and more loving. Cats have strong maternal instincts. When they see a young animal in need, they will care for the animal. Especially when the animal has no mom around. You can easily see a mommy cat caring for young ducklings, puppies, ferrets, and other odd baby animals. Animals are amazing creatures. The oddest pair can easily be the best of friends. Cats and horses are beloved human companions. But if you ever saw a cat and horse together, you’ll know why. 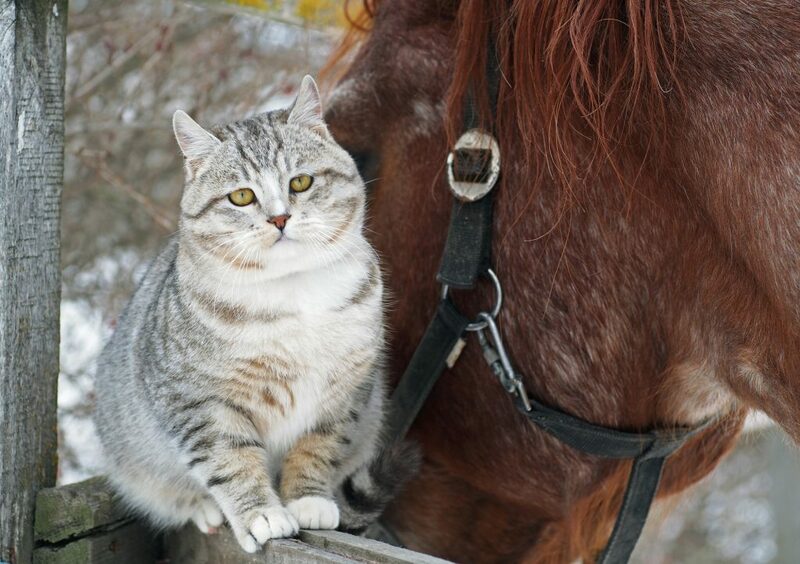 Even though their size difference is immense, cats and horses show similar personality traits. This is the start of a great bond. Cats can be friends with all sorts of animals. They aren’t the scaredy cats we assume them to be. For more cat facts and information, visit our cat blog.